Featured Teachers is a new initiative by ClassHook to recognize the amazing work that teachers do every day. Each Featured Teacher post will focus on the work of one particular teacher and how that teacher engages and inspires his or her students using popular media. Our first Featured Teacher is…Cate DiNitto! Cate is a 9th grade English teacher at Dover High School in Dover, NH. 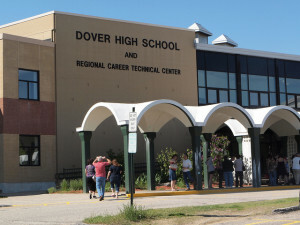 Dover High School is a public school and has a lot of the tech you would expect in such a school: a SMART Board in some classrooms, computer labs, and laptops. Cate has been teaching at Dover for about three years and teaches topics such as Storytelling, Grammar, Greek mythology, and Shakespearean literature. Cate has a course load of five freshman English classes and really loves working with this age group. Cate tries to incorporate media in her classes whenever possible. She often includes short clips to enhance student engagement and add some fun into the learning process. Her students are always excited when they get the opportunity to connect what they are learning with popular media. Recently, Cate taught Shakespeare’s Romeo and Juliet. This Shakespearean tragedy, praised as the greatest love story of all time, can sometimes be difficult to comprehend. Old English is understandably challenging for students to read, and as a result it can be hard for them to grasp the full plot and order of events. So, Cate turned to media for some support. She showed her students a clip from the 1968 movie, Romeo and Juliet, in which Romeo and Juliet fall in love at first sight while at the Capulet masquerade ball. After showing her class the clip, Cate believes her students better understood the plot of the drama, as they were able to visualize the situation that Romeo and Juliet were in. It is evident to Cate that movies and television both positively impact student learning and profoundly affect her students on a personal level. When she started teaching the English parts of speech, her students referred back to their middle school years, when teachers showed them episodes from Schoolhouse Rock!. The fact that her students jumped to the thought of Schoolhouse Rock! so quickly is testament to this idea. The ability of a student to associate a familiar character or scene with an in-class concept is an incredibly powerful learning tool – and one that popular media excels at. Creating these associations is important for retention because the lesson will have more meaning to students, as it can be connected to information already stored in their long-term memory, with the character or scene being in long-term memory. If you’re not planning on showing a full-length movie, Cate suggests using short clips to get your students interested in class. Cate also believes that mixing in clips with regular instruction is a great opportunity to give students a brain break. In addition, clips allow students to visualize the in-class lesson and can reinforce concepts that they aren’t quite understanding. Cate doesn’t limit her popular media usage to just instruction, though. She’s used clips as a fun way to interact with her students and get to know them better at a personal level. For instance, after showing a clip for instructional purposes, she would ask her class who has seen the show in order to start a discussion. Cate notes that TV and movie clips can create a connection between the teacher and her students in ways that other educational clips cannot replicate, as they are ingrained in our society. Thank you, Cate, for creating a compelling learning experience for your students! We appreciate it very much and are sure your students do, too! This entry was posted in Featured Teacher, Student Engagement and tagged Featured Teacher, Popular Media, Romeo and Juliet. Bookmark the permalink.